Mitch Marner: As good without the puck as he is with it - The Point Data-driven hockey storytelling that gets right to the point. By now, you’ve seen, heard and read all about how good Mitch Marner is with the puck. How he’s 2nd in the league in assists, how he’s registering primary assists at a near historic level and how he’s creating a ton of offense for one of the highest scoring teams in the NHL. Well, I want to spend a bit of time talking about how good Mitch Marner is without the puck because his play away from it has been just as impressive as his play with it. Marner doesn’t rely on his linemates to get him the puck. He’s constantly buzzing around, anticipating where the puck will be and putting himself in position to pounce on it when the opportunity arises. One example, the Maple Leafs opening goal in their game against Boston on Monday night where Marner pressures David Pastrnak, forcing a turnover, before setting up Travis Dermott for his first tuck of the season. Ferraro’s comments ring true when looking at where Marner ranks in terms of collecting available pucks on the ice. 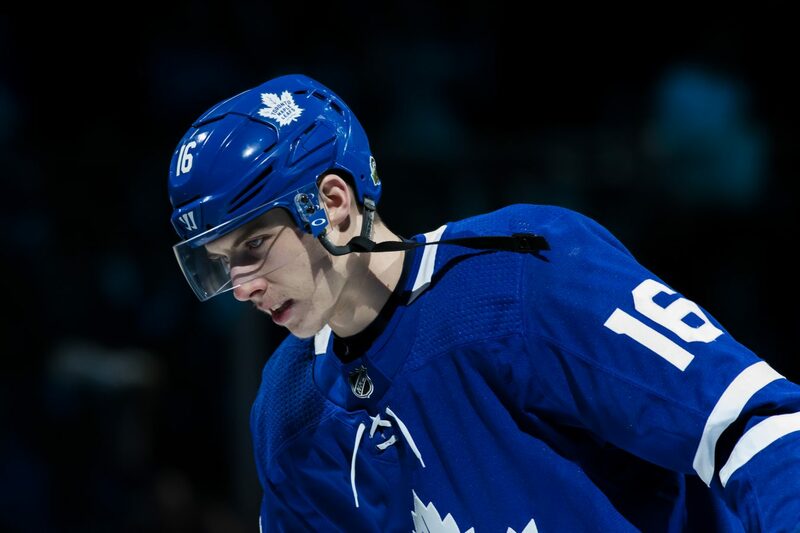 Marner ranks 14th among forwards in the amount of loose pucks he recovers at even-strength, 16 per game, a testament to his awareness and ability to read plays. Another prime example of how effective Marner is on the defensive side of the puck can be seen in the clip below, also from Monday night, where he blocks a pass, creating a scoring chance for himself. No forward in the league has blocked more passes in the offensive zone this season than Marner, who averages nearly 3 per game. Marner also ranks 2nd to Mikko Koivu in total blocked passes. The line of Marner, Tavares and Hyman is dangerous enough when they get one quality chance – give them two or three and you’re asking for trouble. 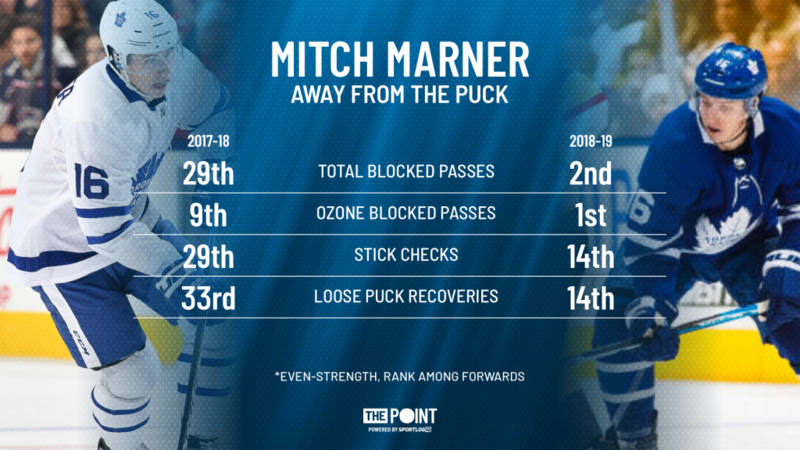 The notion that Marner is an effective and active player away from the puck isn’t exactly a revelation – if you’ve watched him play over the last couple of seasons you’ve likely noticed it. However, it is worth pointing out that he’s gone from above average to elite in a few key areas when measuring how involved a forward is when he doesn’t have the puck on his stick. Marner can mesmerize you when he has the puck on his stick but keep an eye on him when he doesn’t have the puck the next time you watch the Leafs play. The way he reads opponents, anticipates what they’re about to do before they do it and times his defensive actions are all part of what make him such a unique talent.